Metallica have scored the rare feat of landing three songs simultaneously on the US charts, according to Billboard. "Atlas, Rise! ", the latest single from the band’s forthcoming tenth album, “Hardwired…To Self Destruct”, debuts at No. 22 on Billboard's Mainstream Rock Songs airplay chart. The tune joins previously released tracks "Moth Into Flame" at No. 6 and "Hardwired" at No. 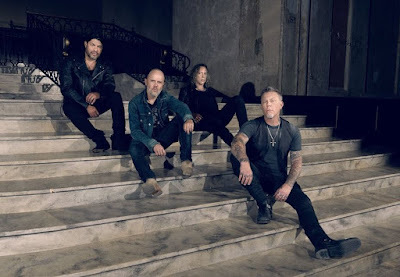 23, marking the first time that an act has charted at least three songs on Mainstream Rock Songs simultaneously since Metallica last did it in 2008 with tunes from “Death Magnetic” including "The Day That Never Comes" (No. 1), "Cyanide" (No. 35) and "My Apocalypse" (No. 40). Due November 18, the two-disc “Hardwired…To Self Destruct” was produced by Greg Fidelman, guitarist James Hetfield and drummer Lars Ulrich. The band will launch the project next week with appearances in Berlin, Germany on November 14, in Paris, France on November 15 and London, UK on November 18.